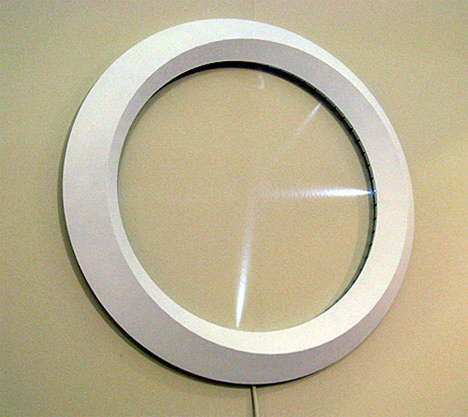 When off, the Good Afternoon Clock looks like nothing more than a plastic circle hanging on the wall with a cord attached. 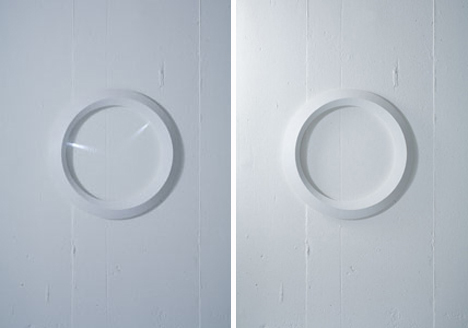 But when it’s on, it becomes a beautifully simple clock that tells time with thin beams of white light coming from the ring and shining inward. The lights tell hours, minutes and seconds in the most clutter-free clock display ever. The delicate and ephemeral nature of the light beams may well be a comment on time itself: it is fluid, fleeting and intangible. The Good Afternoon Clock was created by the MILE Project, a group of three friends who met at the University of Tsukuba. The software engineer, acoustic engineer and interior designer all bring their own unique talents to each project they embark on, and the Good Afternoon Clock is just one of their fascinating and beautiful designs. Unfortunately, it doesn’t look like this particular design is being produced for purchase at this time.